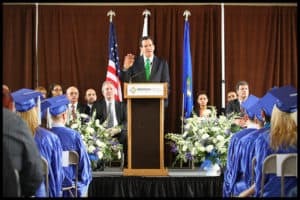 Hartford, CT – Addressing the graduates of American Institute’s West Hartford campus on April 28, 2011, Governor Dannel P. Malloy spoke of the challenges his own father faced as he balanced the responsibilities of family, work and education, after having to leave college and return to school as a working adult. He told the graduates, “You have made the same type of decision for you and your children’s future that my father did for our family. This helped him succeed in business and provide for his family. You too prove that it is never too late to go back to school to advance your education. I understand the great personal commitment you have made; respect your perseverance and determination, and applaud your achievement. Great job graduates. 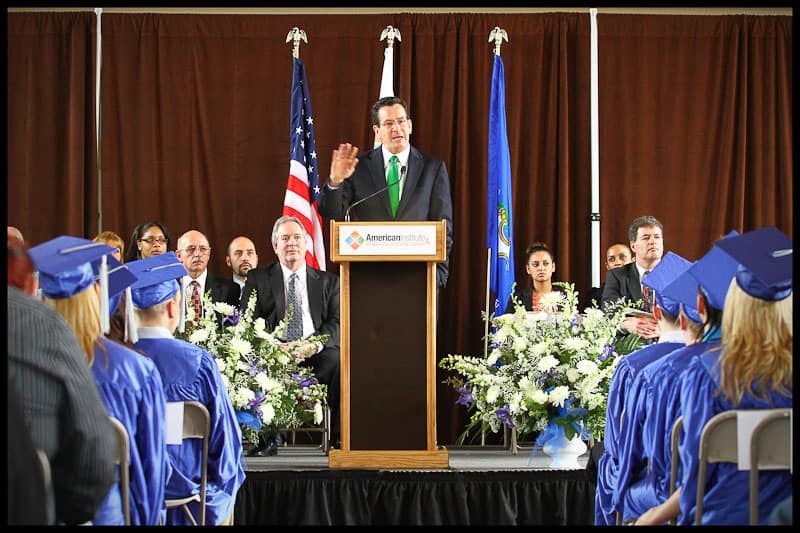 Randy Proto, President and CEO of the American Institutes school group, today commended Governor Malloy on his commencement remarks. “The Governor’s remarks were poignant and heartfelt. Not everyone understands the demands that our students face. They are often busy working adults who balance families and jobs while they attend our institution. They take on the challenge of advancing their education as independent adults. The Governor not only spoke directly to these challenges and the balancing act our graduates accomplish, by speaking of his father’s non-traditional path to success through adult education, he also let them see that they are a valued and respected part of a great intergenerational tradition: a tradition of taking the risk and trying to better themselves as they build a better future for their families.” The American Institute graduates were honored to have the Governor of the State of Connecticut deliver their commencement address, his first commencement address of the season, and Mr. Proto called it, “one of the proudest moments in his 30 years in education, and one of the best moments in the school’s 87 years of educating individuals in Connecticut.” The staff, faculty and graduates thank the Governor for his kind remarks and for joining them on their very special day. The graduates were comprised of students from the Medical Assisting program, the Medical Coding and Billing program, the Computer Systems and Business Administration program and the Legal Office Professional program. The school holds graduation ceremonies twice a year.